Now what ? There would be pilots more intelligent than others? And on top of that these are pilots flying in a 500 kg machine with three clocks on their control panel when I have twenty times more in my Boeing ? They go flying with just a map under their arm when I have to carry a 10 kg case full of papers to cross the Atlantic, and I’m not even mentioning all the stuff inside the plane! And they are probably having barbecue behind the hangar on summer nights when I have to deal with updates, revise procedures and what more. And I’m not talking about flight preparation. Ok sure they master better than I do the pseudo potential adiabatic of the wet thermometer, as for the rest! I would like to understand. Well, here is why glider pilots are more intelligent than: ULM, helicopter, passenger plane pilots… and most of all how they become so. Behind that concept of intelligence, it is performance we are interested in, but what performance are we talking about? Here we have to do a little side stepping to compare the sporting performance of a glider pilot with the safety performance of all other pilots, whatever their field of activity. This comparison is possible because the glider pilot, to be able to fly for a long time and fast, must possess the same competence and abilities as the other pilots to fly safely. What are the recurrent contributing factors in air accidents? Bad decisions based most of the time on a wrong or incomplete representation of the reality and complexity of the environment. If you only make good decisions nothing will ever happen to you. In the worst case, you will decide one day not to fly or to turn around, or take on an extra 10 tons of fuel! The one making the best decisions in his glider wins the championship; and in his Airbus he will arrive without damage in spite of extreme conditions. To use it to make the best decisions. There is a cloud forming over Le Cheval Blanc, with the return from the East it might be difficult, I’ll go a bit more West. The weather forecast says there might be a storm in Washington, and in New York the probability of it is even higher. If the sky gets clear over Washington there will be a queue to land there, so I’m going to take an extra 10 tons of fuel. The last two examples tend to prove that intelligence is useless if you do not make use of the information you gathered to prepare your decisions. Now, the decisions you are going to make are not the same if they are about management of your machine : of the systems, the piloting ; or the management of your environment with its cumulus and its bad weather. If you project yourself far ahead in time, you are in a tactical and strategic attitude, with a lot of unknowns, of conditional elements: if… then… but maybe… so… and if… A gliding champion sees far ahead and speculates a lot. If he wants to be the first to arrive the glider pilot sometimes has to make decisions very quickly. I am at the ceiling and things are going well with 50 km to go. Let’s see how things present themselves ahead: the shadows of clouds on the ground, the shape of cumulus… There is a nice street of clouds on the right but taking me out of my route. I have to decide now. I estimate a 30° route alteration, the wind in coming slightly from the South, I’m going to end up towards… Let’s go left. I’m arriving in Geneva from the North, the weather today is really bad. Ok, there is quite a bit of traffic, the controller will probably take me quite far in the tailwind before the base stage towards the ILS. « Camembert 72, would you be ready to turn right towards the ILS in 3 nm? ». S… we are still on FL 150 ! I’m at 20 nm in the north of the field, I’ll have 15 nm left in the final approach, therefore 4500ft, plus 1500ft of altitude, I can loose 5000 ft in the base leg… it’s a bit just (Time Pressure and Public Transport: 50% of accidents). Ok, until now it’s a nil-nil draw, with maybe a little advantage to the glider pilot. Glider pilots are not the only ones thinking ; other people deep in their research have listed the pilot mental activity into six levels of requirements in an increasing order of difficulty. The first three levels roughly mean : « do as usual » ! 1600 m at La Vaumuse, I head for Authon (sorry if I get it wrong that was a few years back). The weather is good in Washington, so let’s take 110 tons of fuel. In the last three levels you have to think, with the last level dealing with the complex situations without obvious solutions. And that’s where neurones have to come into action to fly fast and to fly safe. Now, the more often you agitate the neurones the easier it is, and the less you do it the more viscous they become. In other words, the more the pilot’s higher mental codes (intelligence) are solicited, the more they become easily accessible and efficient. How many decisions engaging higher modes, said intelligent, a glider pilot has to make in a 5h flight ? Hundreds, more or less elaborate. How many decisions engaging higher modes, said intelligent, an airline pilot has to make in a 5h flight ? Do you know the answer? Not a lot? That’s right, not a lot, but … but that depends on which pilots. Some will dissect their flight and analyze a multitude of little things, probabilities… in short they think. Others will have a more relax approach, with the decision of the day being to have their coffee with or without sugar. Here the glider pilot is clearly ahead of the pack. A pilot has to think fast, in an open environment where he is mostly left to himself; with the speed dimension, the fighter pilot also has to make use of his neurones. Obviously the problematic faced by the pilot of a hot air balloon is not the same, but as anticipation is concerned he has to be on top of things. An airline pilot operates in a very closed environment with very little place for adjustment, whereas a glider pilot flies in an open environment in which he has to adapt constantly. If he doesn’t think a minimum, he is on the ground a few minutes later! When the A320 Airbus started its career, the journalists told us anybody could fly these planes. And if the journalists say so! The intelligence of the pilot can be trained. In fact it is one of the objectives of training that can be found in many programs around the world and says : « At the end of his training the pilot will be able to face a new situation ». We have to link things together. It is also the development of the higher mental modes in the trainee pilot that’s part of the objectives of some trainings (for the ones who know, there is a problem resolution module in the training for passenger plane pilots regarding the cabin crew resources: one or two sugars?). Good news if your are not a glider pilot, not everything is lost ! There is a risk management concept called Threat and Error Management which has the particularity of asking the pilot to think, to project himself ahead in time to prevent some extreme threats from disturbing the flight and bringing undesired situations. 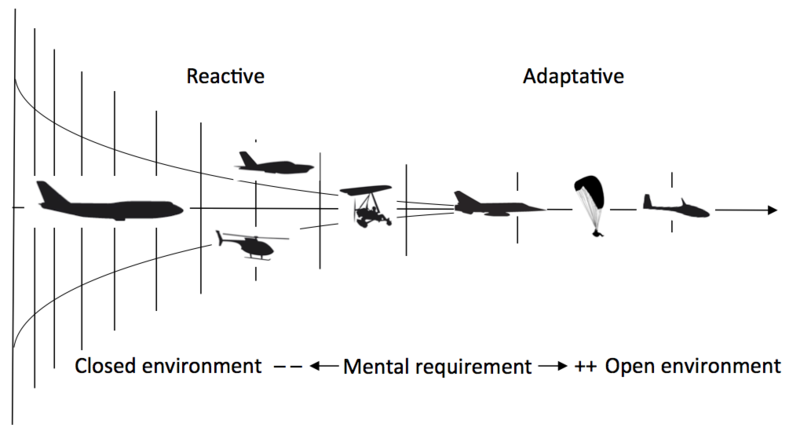 The mental approach necessary for this « proactive » risk management is the same as the one used by the glider pilot, who deals with risks to obtain a sport performance. You have to think well, fast, and project yourself into the future. Thank you for your comments. Did you watch this space ? Where do you think a Hang-glider pilot belongs on the mental requirement graph? Comparing to a paraglider it is a bit faster but needs much more landing space, so cost for taking risks is higher. Comparing to a glider it doesn’t have as much gliding performance, so the reach is more limited, and so are the landing options. As both a glider pilot AND airline pilot, I can testify that the latter are not the brightest of the lot. Most don’t have a clue about energy management , except for what the FMC tells them. This is more true the higher the technology of their aircraft. Moreover, the commercial environment tends to « box » the pilot’s brain (which seems like a contradiction in terms) in rules and procedures. Many commercial pilots tend to forget to look at the big picture and sometimes fall behind the aircraft because they are too concerned about following the procedure rather than understanding why the procedure was built in the first place (stat rosa pristina nomine, nomina nuda tenemus). At the end of the day, I guess that rather than a matter of pure intelligence, the main difference lies in the use we make of it in building the situational awareness necessary to « survive » very difficult situations. Reinforcing your assertion that glider pilots are more intelligent than airline pilots is the flight of the Gimli glider (http://en.wikipedia.org/wiki/Gimli_Glider), a Boeing 767 captained by a glider pilot, which ran out of fuel in midair due to malfunctioning fuel gauges and a series of errors on the ground before takeoff. The pilot used his glider piloting skills to safely land the plane at an abandoned airport. Later, several attempts by other crews who were given the same circumstances in a simulator resulted in crashes. The pilots of the Gimli glider were awarded the first ever Fédération Aéronautique Internationale Diploma for Outstanding Airmanship. Hey, nicely done.. now I start to understand why nobody seems to understand me..
Has the author flown a machine other than a glider? A great deal of his argument seems to stem from the equivocation of intelligence as being inversely proportionate to proceduralisation. i.e. Glider pilots are most intelligent because their environment is the least procedural. This fails to address many other measures and factors which contribute to intelligence. Also, has the author considered other highly unproceduralised flying environments; Air combat, helicopter operations to unprepared sites and malfunction handling in a complex aircraft. Flexibility is not intelligence. A glider pilot who misjudges his performance and lands out suffers (maybe) embarrassment or an undercarriage problem at the worst. A fighter pilot in air combat, or a military helicopter pilot making an approach to an unknown site, at night, on NVG who makes a similar mistake might well die or at least wreck his machine. Very few military/civil aircraft crash compared with the number of glider off-field landings that occur each year. Glider pilots have a demanding environment for sure, particularly if the aim is to win an international competition, but their machine is far more forgiving than most others. I agree with Jonathan. The author presents somewhat simplistic assertions and arguments without convincing evidence. This article makes the reader think, but it’s hardly a sophisticated exploration of the topic. I’ve only flown gliders, but I’m open minded. I concur with Jonathan as well. I’ve flown gliders, light aircraft, attack helicopters, airliners and paragliders. The view the author sketches is rather simplistic. Especially in military aviation the amount of factors to take into account on every decision you make, far surpass anything thrown at a glider pilot. All that while flying in an environment demanding a lot more attention to detail than that required of a glider pilot. Even with airliners is not so cut and dry as the author suggests. This article does not pretend to have a rigorous approach, that’s why I write it with a humorous tone. It’s about flexibility, adaptation, decision with different aspects like this one : » Competence is inversely proportional to the degree of proceduralization of the activity ». A message could be : take care to the routine, flying is not so simple. Don’t forget the big picture. The ranking of the different activities is not so important. I’ve flown also gliders, fighter and now in an airline. I even have to say that I enjoy gliderflying so much, because it is so simplistic compared to the professional aviation. In a glider, you indeed have to make a lot of decisions in a xcountry flight, but for example in an airline the drcisions are so far more wide spread. A LOT more can happen. Wx, operational requirements, technical failures, problems with crew and passengers, time limits, energymanagement of a 60 000kg aircraft, atc dificulties, and so I can go on! ;) I like the post, and also the gliderflying, but it is not a realistic view. It is a message with a second level of interpretation about the pilot training philosophy, about the level of proceduralisation of the job… (airline) wich is very interesting but it is not without danger. If we are able today to put a pilot on the right seat with 200 flight hours, idealy the left seat requires at least ten years of experience. There is no time to rest on our qualifications. Pilot must remain vigilant and be wary of the routine. But this is not the case for all crews. Here is an example among others : « Highly effective cockpit crews use one third of their communications to discuss threats and errors in their environment, regardless of their workload, whereas poor performing teams spend about 5% of their time doing the same ». Sexton JB. Content analyses of cockpit communication. My previous message is in the same view. Thank you for your message Dave. I’ve been and owner and pilot flying sailplanes (gliders) and small single engine recreational airplanes for over forty years. Mika makes an interesting point which I agree with in principle. I would be careful not to focus on the word « Intelligent », but rather « situationally aware », which does not necessarily encapsulate « intelligence » and « stick and rudder » skills need to be an exceptional pilot , glider or powered aircraft. When it comes to « situational awareness », I think David Foster Wallace, in his commencement address, « This is Water », explains the difficulty to be aware of the « obvious » because we are taught (trained) to approach problems using « hard-wired » thinking, e.g. check lists. I strongly believe in using check lists, but there are numerous example in aviation where the pilot survived by thinking « outside the box ». The best example is « Skully Sullenberger », who landed in the Hudson river. Skully was enrolled at the United States Air Force Academy in 1969. He was selected as one of around a dozen other freshmen for a cadet glider program, and by the end of that year, he was an instructor pilot. I fly sailplanes and am also a glider pilot……I fly sailplanes and am also an airline pilot…….If we compare accident statistics of airline pilots to those of glider pilots and were to say the safer pilot group were more intelligent , which group would appear to be more intelligent? Where do commercial pilots who also fly gliders fit in? Do you not think the skills are transferrable? Previous: Pourquoi les pilotes de planeurs sont les plus intelligents ?